DOWN TO THE THOUSANDTHS` What makes one carbon arrow cost $149 a dozen and another cost $69 a dozen? There are a number of ways a particular carbon arrow might be perceived as a "premium" arrow (cool graphics, clever nocks/inserts, special materials, flashy marketing, etc. ), but nothing affects the market value of a carbon arrow like advertised straightness, where the difference between the penthouse and the trailer park is just five thousandths of an inch. An arrow that's advertised to have a +/-.001" straightness is automatically an elite pro-grade arrow worth big bucks. An arrow with a lowly +/-.006" straightness is the entry-level hunter grade arrow which is sold as a basic commodity. Make sense? Most carbon arrows are advertised to have a specific straightness tolerance between .001" and .006". You won't find many arrows with straightness tolerances outside that range. This is what the customer base expects and accepts. So that's what we get, and the pricing is fairly linear and predictable from +/-.006" to +/-.001". The straighter the arrow, the more expensive it typically will be. Does that make sense mathematically? Probably not. The entire spectrum spans a few widths of human hair. Nevertheless, that's the carbon arrow market - where straightness is king. HOW TO THEY MEASURE THAT? Before we get too deep into this topic, it's worth noting that there doesn't seem to be an accepted universal method for HOW arrow straightness is measured. Per ATA/ASTM standards, arrow straightness should be measured along the full length of the shaft minus two inches. But as we understand it, this is NOT how things actually go inside the industry. On a number of occasions, we have heard arrow companies accuse each other of cheating their straightness measurements - either by measuring only short sections of their arrows, or by obtaining their straightness numbers via undisclosed measurement methodologies. Every arrow manufacturer is absolutely sure their numbers are accurate and their competitors' numbers are fabricated. If you think the bow business is cut-throat, you should witness how the arrow companies go at it behind closed doors. To avoid being shanked at the next trade show, we'll stay neutral and assume that everyone's' arrow straightness numbers are reasonably honest. But just be advised, there are certainly some cowboys in this market. A tolerance of +/-.001" is good work for a CNC mill on aluminum alloy. The idea that a piece of thin flexible tubing can hold that tolerance along a full 28"+ length is, well, quite fantastic. STRAIGHTNESS CLASSES: GOOD, BETTER, BEST` Arrows are essentially priced on the good - better - best model, like many products. We all know how that works. Maybe you just want the regular, or maybe you're a premium high-octane kind of buyer. Well, let's examine the typical straightness "classes" of arrows and see how this works. 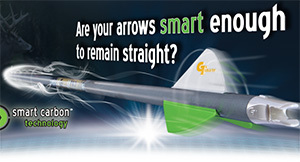 Most standard-grade carbon arrows have an advertised straightness of +/-.005-.006". These shafts are usually marketed exclusively to the hunter and beginning archers. 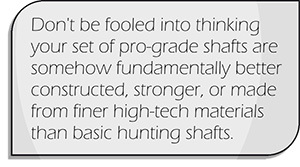 For the purposes of big game hunting and general target use, standard-grade shafts are more than adequate. A typical human hair is about +/-.002"-.004" in diameter, so even a basic carbon shaft of +/-.006" straightness is quite remarkable, and much straighter than you could possibly perceive without specialized equipment. But these "basic" arrows sell cheap (under $80/dz typically). To entice buyers wanting something a little better, most arrow shaft manufacturers also offer mid-grade shafts which will have an advertised straightness of around +/-.003-.004" along with a moderate pricing premium. But for the real experts, for the high-octane buyers who only get the best, every arrow maker has their pro-grade shafts which claim a straightness of +/-.001-.002", which is truly outstanding. As you might expect, these premium grade arrows fetch a premium price (+$130/dz). If you're the kind of buyer who spares no expense, then by all means, buy the straightest shaft you can find. But before you shell out the green for a +/-.001" shaft, there are couple things you might want to know. CUT FROM THE SAME CLOTH` The difference in a +/-.006" shaft and a +/-.001" shaft is more razor-thin than you might think. Today, most carbon arrow shafts are constructed by taking very thin layers of carbon sheets and rolling them up into perfectly straight tubes (usually 6ft. long or so), much like you might roll-up a big map. The layers are wound around a metal mandrel, then the carbon tubes are heat-treated to bond all the layers together. When the heating process is complete and the carbon tubes cool down to room temperature, they are cut into sections (raw shafts). Some of the shafts, particularly those that come from the center of the roll, retain their ±.001" straightness while other sections distort slightly from the heating/cooling process. As we understand it, the results vary from run to run and day to day. In most cases, even the manufacturer doesn't know how the day's crop of shafts will come out. But once the shafts are made, the manufacturer measures the straightness of each shaft section and sorts them accordingly for banding and sale. One sort may be named and marketed as one arrow, another sort as something else. For example, the Beman Bowhunter +/-.006" and the Beman ICS Hunter +/-.003" are just two different sorts of the same shaft - same raw materials - same construction technique - different wrapper. Same is true for the popular Gold Tip Hunter ±.006", Gold Tip Hunter XT ±.003", and the Gold Tip Pro ±.001" shafts. They're not different arrow shafts. They're just different cuts of the same raw product. CAREFULLY GUARDED SECRETS` Small variations in the daily manufacturing environment (humidity, pressure, air convection patterns, etc.) 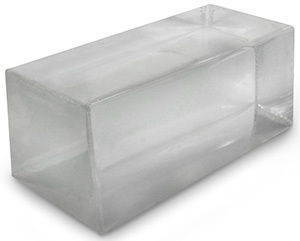 along with tiny deviations in the characteristics of the raw materials ultimately determines the straightness of the finished product. On one particular day, the manufacturer might yield an entire batch of +/-.001" shafts, or an entire batch no better than +/-.006", or even a mixed bag of straightnesses, all from the very same processes and materials. The finer tricks of the trade are carefully guarded secrets, as the art of consistently building straighter arrow shafts is literally a technical exercise in splitting hairs. 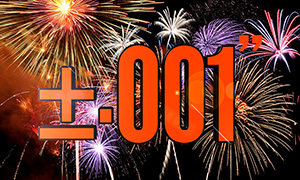 But make no mistake, arrow manufacturers would rather avoid the +/-.006" days. The more ±.001" days a manufacturer has, the more money they can make. Why? Because straighter shafts are worth more in the marketplace, whether they cost more to manufacture or not. So don't be fooled into thinking that your set of $129 +/-.001" pro-grade shafts are somehow fundamentally better constructed, stronger, or made from finer high-tech materials than basic $69 a dozen +/-.006" hunting shafts. This is seldom the case. 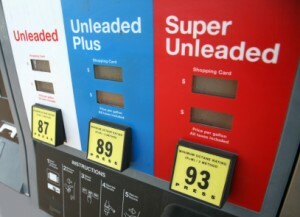 Most of the time, the difference in their regular unleaded and premium is just a few thousandths of an inch. There is even some discussion suggesting many of today's +/-.006" shafts aren't really +/-.006" shafts at all. They're better than that - mostly +/-.003-004" shafts. But since arrow manufacturers sell a LOT of entry-level shafts, they need product to fill those orders. If enough of the crooked +/-.006" shafts aren't available, they build-out the entry-level shafts with the next best sort. Ha! Free upgrade. Who doesn't love the sound of that? OF COURSE IT DOES` From a pure physics standpoint, yes! Arrow straightness certainly does matter. We all remember how a bent aluminum arrow fishtailed and corkscrewed wildly. Yes! Straighter arrows undeniably fly more accurately. In long-range laboratory conditions with a mechanical shooting machine, the straightest arrows with the best spine consistencies will always group best. But try to keep this issue in reasonable perspective. You are not a mechanical shooting machine. You don't shoot in laboratory conditions, and you probably don't shoot at extreme distances (100+ yards). The straightness difference in a +/-.006" arrow and a +/-.001" arrow is mathematically minuscule. We're not talking about the kind of distortion you would see in a bowed 2x4 at Home Depot. We're talking about tiny hair widths. So we have to admit, the real world benefit of a +/-.001" arrow probably has more to do with selling arrows than shooting arrows. The truth is, only a handful of the world's archers actually have enough shooting skill to truly differentiate between a very good +/-.003" arrow and a "pro grade" +/-.001" arrow. And within the typical bowhunting range, any difference would be practically imperceptible. Nonetheless, bowhunters tend to attribute their successes or failures to their equipment rather than to their actual skills. So owning and shooting a set of professional grade +/-.001" arrows may provide some bowhunters with an edge in confidence, even if the actual technical advantage is negligible. If you're one of the many archers who believe that success is only one more purchase away, buy whatever arrows you like. Just remember that super-straight arrows won't correct poor shooting form. In the end, the benefits of a good practice regimen and proper bow tuning will FAR outweigh the benefits of shooting expensive arrow shafts. But don't tell the arrow companies we said that. ARE CARBON ARROWS STRAIGHTER THAN ALUMINUMS? Yes and no. While a carbon arrow's advertised specs may be no straighter than a typical aluminum shaft, carbon arrows resist distorting and "bending out of shape" much better than aluminum arrows. Though an aluminum shaft may BEGIN with a similar +/-.003" straightness, its straightness quickly deteriorates through normal use and handling. So after a few months of use, your aluminum arrow set may contain a few arrows that are at original specs and some that are grossly out of straightness. Carbon arrows generally do not retain this kind of "memory" after being stressed (bent). So your carbon arrow set stays much more straight and uniform - even with heavy use. Some archers even joke that there are only two states of a carbon arrow: straight or broken, but never bent. While that's not entirely accurate, it does help to illustrate the point. SPINE CONSISTENCY PROBABLY MATTERS MORE` Remember how we mentioned the cut-throat squabble about arrow straightness? Well, the same is true for spine consistency, and this spec is sometimes discussed as a matter of manufacturing tolerance. So we'll mention it here. If you test for spine deflection while slowly rotating the arrow, the spine deflection should remain constant. No matter which direction you bend the shaft, it should be equally resistant at all points, right? Nope! The wound layers of a carbon arrow will often have a seam somewhere inside the circle (unless the shaft is filament wound). This seam creates an imbalance in the spine consistency of the arrow, such that the arrow is a bit more stiff at one point around the circle. It's unfortunate, but the process by which carbon arrows are manufactured inevitably results in some imperfections. And if you want to get really technical, most arrow shafts aren't even perfectly round for that matter. But the important question is, does it really make a difference? From a pure physics standpoint, yes. But again, few shooters have enough skill to notice small variations. For the weekend bowhunter and backyard enthusiast the issue is largely inconsequential. But that doesn't stop the arrow companies from bickering about who has the best spine consistency and accusing each other of spine crimes. After all, every arrow company wants YOU to believe that their arrows will give you a technical advantage, even if that's a little distortion of the truth. Again, we'll avoid the internal melee here by not pointing fingers, but if you wish to know more about spine variance, check the forums. There are a few forum regulars out there who own spine testing devices and Hooter Shooters. And they'll be happy to disagree with us on this issue. Despite the debate, consumers remain surprisingly blasé about spine consistency, and most manufacturers struggle to make technical hay about their spine consistency specs. Most buyers are just fixated on straightness. THE NEEDLE AND THE SWORD` Here is another issue that probably gets more press than it deserves - arrow shaft diameter. The mainstream hunting arrow market is dominated by the 9/32" and 5/16" ICS style shafts. If you haven't held a modern carbon arrow, they're about the diameter of a Bic Pen or a #2 Pencil. This "standard" diameter carbon arrow has been around for more than two decades. We like them. They work. Some arrow manufacturers never stray far from this convention (at least for the hunting market). But others are constantly trying to push the narrative that smaller diameter arrows are better (and worth a pricing premium of course). Sometimes they're referred to as Slim or Micro-Diameter or even Ultra-Micro Diameter and they are typically 1/4" to 17/64" O.D.. Since small diameter shafts don't accept standard nocks and inserts, they all come with their own propriety components (and associated headaches). But that's okay. The small-diameter shaft promises to be "harder hitting" and "deeper penetrating", and as a strict technical matter that might actually be true. The tip of a needle certainly penetrates flesh more easily than the tip of a sword. Nevertheless, we submit there's some monkey business in such marketing. If a "micro-diameter" arrow is .250" (1/4") and an ICS standard shaft is .3125" (5/16"), then we're really talking about a maximum difference of just 1/16th of an inch - about the thickness of a dime. Is it really possible this 1/16th of an inch could make such a profound difference in hunting penetration? Hmmm. We will leave the final conclusion to your good common sense, but we suspect this is another situation where the benefits of a "premium" product are more apparent at the cash register than in the treestand. The best selling aluminum arrows of the 80's and 90's were all in excess of .343" O.D. So perhaps the standard ICS style carbon shafts are already small diameter arrows. But as long as consumers see micro-diameters as an innovation, the current narrative is likely to continue.